When starring as the Joker in The Dark Knight, Heath Ledger asks a fearful Rachel Dawes (Maggie Gyllenhaal), “Do you know how I got these scars?” Without the obviously threatening context, the words themselves leave you with a feeling close to what I experienced while watching Rajiv Josephs’ Gruesome Playground Injuries. The aesthetics of the play do seem a little self-centered, in a “please watch this because it’s so important” kind of way. However, the human dialogue and chemistry between the two actors on stage combined with well thought out direction within the scenes made this one of best shows I’ve seen at STAGEStheatre thus far. 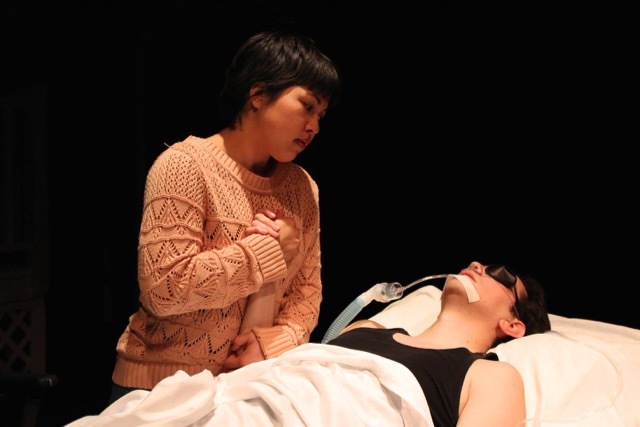 Set at pivotal moments in their lives and told in a random order, Gruesome Playground Injuries is the story about a deep friendship forged through the sick and often gruesome conversations between Kayleen (Vanessa Marie Babida) and Doug (James Villarreal). Basically we have Doug, who is pretty much an idiot and has the scars to prove it. As members of the audience we never get to see any of the accidents take place, but we are filled in on all of the dirty details he dispenses to Kayleen. Most if not all the injuries Doug experiences stem directly from his actions, but the character doesn’t have a death wish. He’s just bizarre, maybe a little too bizarre as his motivations for self-destruction aren’t really explained or covered in the show. I guess we can chalk it up to Doug being cuckoo. I would have liked to know more about what makes Doug tick, but as I continued to watch the show and dissect the themes, I realized we aren’t actually given fully realized characters. Let me explain- while Doug’s injuries in the show are more obvious because he literally hurts his outward appearance, Kayleen’s injuries are all internal or hidden (there is a scene where she cuts herself but even those scars are kept out of sight). There is a clever dichotomy of visible and invisible injuries springing up between both characters. So although Doug appears to be the worse off party in the story that isn’t really the case. In the process of keeping to these themes Rajiv Joseph’s purposely leaves a lot of character development out of the play. There are scripts and stories where you want to leave things a little vague and it’s also okay to bypass a few details to bring focus to the main plot. In this case, the story is completely bare bones. It’s only two people and their feelings. When you do that the show better go all out. The chemistry between Vanessa and Villarreal cannot be understated. It was addicting to watch them. This show is too short! I wanted to know more about these people, but something tells me he didn’t write this with a sequel in mind. Once on stage the actors never leave it, choosing to dress in front of the audience during the transitions. The show starts with them unclothed (not naked they have leotards), and then they don different outfits between scenes. Such banal life moments are usually brushed under the rug. However, in this story the dressing room transitions are a brilliant addition by Director EB Bohks, keeping the momentum of the play active.